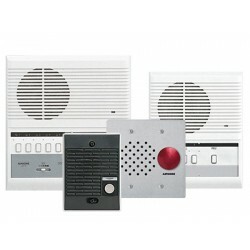 The LEF Series is a selective calling, open-voice audio intercom system with the capacity of up to 11 total stations. The system can be designed to meet a wide variety of needs, including any combination of master and sub stations, up to its maximum capacity. Design the system based on the total number of master, door, and sub stations, choosing the right sized master station from 3, 5, and 10 station models, surface or flush mount. The LEF Series is a selective calling open voice, audio only system with the capacity of up to 11 total stations. The system can be designed to meet a wide variety of needs, including any combination of master and sub stations, up to its maximum capacity. LEF-10 10-Call Master Station FEATURESProvides internal communication to LEF master stations or..
LEF-10C 10-Call Semi-Flush Mount Master Station FEATURESProvides internal communication to LEF ..
LEF-10S 10-Call Master Station with Provision for All Call FEATURESProvides internal communicat..
LEF-3The LEF-3 is a selective call open voice style master station with the capacity of up to 4 tota..
LEF-3C 3-Call Semi-Flush Mount Master Station FEATURESProvides internal communication to LEF ma..